The uproar in the West, and in the United States in particular, that followed the summit meeting between presidents Trump and Putin in Helsinki on 16 July last, fits into the intense anti-Russian campaign that had been going on for many years. A key moment in that campaign was the downing of Malaysian Airlines Flight MH17 on 17 July 2014. That tragic event, in which all 298 people on board perished, allows us a view of a far broader set of large-scale historical developments. These developments include the NATO advance into the former Soviet bloc and the actual USSR, with the EU in tow; the resurrection of a strong, directive state in Russia after a decade of economic plunder and social degradation; the energy connection between Russia’s Gazprom and EU countiries, and the slow coming together of resurgent Russia with China and other members of the loose blocs formed between them, such as the Eurasian Union and the BRICS countries. My book analyses this larger context; with respect to the actual downing it tries to come as close as possible on the basis of established facts, on which one can then meaningfully base further hypotheses and inquiry. The February 2014 regime change in Kiev placed state power in the hands of Ukrainian ultra-nationalists and anti-Russian billionaires intent on removing the country from the post-Soviet orbit and reorienting it to the West. Like other successor states of the multi-national USSR, Ukraine then began to fracture as a result of Western forward pressure. The US State Department through assistant secretary Victoria Nuland and the US ambassador, Geoffrey Pyatt, played key roles in the coup d’état; after its successful completion, followed by the secession of Crimea and an armed uprising in the eastern Donbass area, the NATO command joined in. Hacked e-mails of NATO commander General Philip Breedlove reveal that the war party in the United States and NATO began to elaborate a strategy that would make Ukraine the testing ground for a trial of strength with Russia and China from late March onwards. The re-incorporation of Crimea into the Russian Federation was exploited to evoke the spectre of an expansionist Russia threatening invasion on several fronts. After all, the Russian Federation Council had authorized Putin to deploy troops abroad in response to threats, basically to protect Crimea from the new regime in Kiev (an authorization revoked again on 24 June, to facilitate a ceasefire). Breedlove, commander of US Eucom (European Command, one of nine regional US military commands spanning the globe) and NATO Supreme Allied Commander Europe (Saceur), envisaged two fronts in the ‘Russian invasion’, the Baltic states with their large Russian minorities, and Ukraine. From the correspondence of 5 and 6 April between Phillip Karber and General Wesley Clark, a former NATO Saceur, it emerges that they were already advising Kiev forces in eastern Ukraine before the Donbass had actually risen in revolt. Karber is the ex-CEO of the aerospace consultancy, BDM, and president of the Washington think tank founded by it, the Potomac Foundation. One major line of his activity was to assist former Soviet bloc countries in their quest for NATO membership and the coup regime in Kiev sought his advice too. A US Marines veteran himself, Karber in his e-mails to Breedlove reported positively on Ukrainian army units deployed on the ‘northeastern front’ (no fighting had erupted yet). On 6 April, government buildings in Donetsk and other cities were occupied by local residents fearful of the forces unleashed by the ultra-nationalist coup in Kiev. For one of Karber’s and Clark’s correspondents the occupations were ‘the beginning of the second phase of the scenario for the Russian invasion in our country’ (after Crimea). Clark forwarded this information to Nuland and Pyatt an hour later. Thus, the narrative of the ‘Russian invasion’ reached the highest echelons of the Western war party early on and it remains the framework in which events in Ukraine are being interpreted. On the weekend of 13 to 14 April, CIA Director John Brennan was in the Ukrainian capital. The attack against the insurgency, the ‘Anti-Terrorist Operation’, began right after Brennan’s visit; armed volunteers hurried to the east to join the fighting, as the regular army’s appetite and readiness were limited, in spite of $2 billion in credit guarantees granted to the Kiev regime by the Obama administration. In early May, massacres in Odessa and Mariupol worked to snuff out the beginnings of an uprising in the south. Later that month, Andrej Parubiy, appointed as secretary of the crucial National Security and Defence Council (NSDC), visited NATO headquarters for confidential talks. Parubiy was one of the founders of the fascist party of independent Ukraine, commander of its military wing, and responsible for the random killings at the Maidan central square in Kiev that preceded the coup; today he is the speaker of the Kiev parliament. On the 25 th Petro Poroshenko was elected president in a pre-cooked election to give the coup a veneer of legitimacy. A few days before, US Vice President Biden’s Washington office announced that the US and NATO allies would hold naval exercises in the Black Sea in July, codenamed ‘Breeze’. To the dismay of the Donbass rebels, the Russian government recognised the presidential election and on the margins of D-Day celebrations in Normandy in June, Poroshenko agreed with Putin to start talks on a ceasefire in the rebellious provinces. However, later that month a threatening demonstration in Kiev by volunteer battalions demanded the immediate resumption of the civil war. On the 30th of June, following a four-hour NSDC meeting with Parubiy, Interior Minister Avakov, and others whose followers were demonstrating outside, Poroshenko was compelled to declare that the ceasefire would be lifted and a new offensive launched. In spite of a last-minute attempt by EU ministers to prevent a resumption of the fighting, a barrage of accusations from Washington, denouncing Moscow’s supposed interference in Ukraine, worked to encourage Kiev. But did Washington indeed ‘do something really big’, or are we looking at a coincidental prediction? In my book I list all the possible types of weapons that may have been used; who had them, what was their operational status, and so on. Karber actually reported to Breedlove in detail about the state of the Kiev air force available for the Anti-Terrorist Operation. Yet ultimately I stick to an agnostic position, because there is no way to ascertain who actually pulled the trigger; even though all signs point to the Kiev regime and possibly Western, especially US and NATO advisers at hand. Nevertheless, by listing all the elements that have been established, one gets a factual foundation on which certain scenarios can be meaningfully based. Let me try out one here, leaving aside the broader context of the energy struggles and the determination, articulated by Wesley Clark, to militarily confront the Eurasian and BRICS blocs (and Russia and China in particular) and turn the Ukrainian civil war into a proxy contest. Ukraine ceded the direction of the official investigations to the Netherlands whilst retaining a veto on their outcomes. The investigations maintain that the pro-Russian Donbass rebels, or even the Russian military, shot down the plane by using a single Buk SA-11 medium-range surface-to-air missile. Now if one doubts this, and there are good reasons for it, the question arises why the plane broke up in mid-air. First: was it a Buk, as NATO and its echo chamber, the mainstream media, insist? Several military experts familiar with air defence from Soviet times have gone on record that a Buk hit would have made the Boeing explode into a fireball. They refer to the enormous kinetic energy of the impacting shrapnel (small metal pellets) and to examples such as Buk hits in the 2008 war to recapture its breakaway South Ossetia by Georgia. The Russian Ministry of Defence also questioned the Buk theory on the grounds of the impact damage and referred to certain types of air-to-air missiles used by supersonic fighter planes in the Ukrainian air force (I leave aside that Russia never developed a consistent narrative contesting the Western/NATO account). What if the cockpit, riddled with holes (the Dutch Safety Board’s final report of October 2015 estimates that some 800 shrapnel pieces hit it), was not struck by a Buk missile but by an air-to-air missile fired from an Ukrainian jet (the rebels had no planes), possibly also by cannon fire? An air-to-air missile has a much smaller warhead and a shrapnel count more than ten times smaller than a Buk (which contains 7,800 pieces or more). In that case the question might arise why the cockpit broke off in mid-air; the main fuselage, with the wings and the engines intact, flew on for a few minutes, before breaking up into pieces too. This latter break-up can be explained from the amputation of the cockpit section from the hull, but why did that occur? One of the most knowledgeable bloggers on this issue has claimed that the cargo of almost one and a half tons of lithium ion batteries may have caused this fatal rupture. The DSB states in its final report that there was one battery on board and that it was properly packed—1,376 kilos! In fact the plane was a flying bomb, according to Victor Ettel, an expert on the science and manufacture of lithium ion batteries—and he was speaking on Flight MH370, on which there was a cargo of only a few hundred kilos of them, and which Malaysia Airlines mysteriously lost in the previous March. 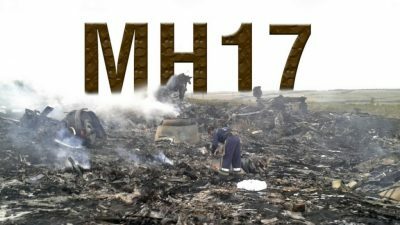 The batteries on board MH17, more than six times the load of MH370, were packed in seven large batches in three containers, most of it stowed in the front cargo section right behind the cockpit (a smaller batch in the rear), with the bill of lading marked ‘urgent’. Clearly, not ‘one battery’ of which the DSB speaks. In the picture below, the (much smaller) battery cargo of MH370 gives an indication of this location; in the DSB report one can see that the cockpit section broke off roughly where the bulk of the batteries were stowed. I stress that this is conjecture, but why did the DSB choose to lie about the lithium ion cargo? As I write in the book, the batteries had been flown to Schiphol by TNT from Grâce-Hollogne airport near Liège, where there is a distribution centre for them (a subsidiary of a UK company). The Ukrainian national airline, owned by the anti-Russian oligarch, Ihor Kolomoiskiy, flies three times per week to this airport, but I found no indication that there was something here to pursue further. What I did find, was that an Israeli-owned company, ICTS, headquartered at Schiphol, has developed the Advanced Passenger Screening with which the details of every flight are reported to the US authorities under existing anti-terror laws. ICTS International NV was established under Dutch law in 1982 by former members of Shin Bet, Israel’s internal security agency, and El Al security agents. Few companies are so directly involved with the terrorism/counter-terrorism complex as ICTS. Its subsidiary, Huntleigh USA, shared security duties at Boston’s Logan Airport, from where the two planes that were hijacked and later claimed to have hit the Twin Towers, took off on 11 September 2001. ICTS also permitted the Nigerian student, Umar Farouk Abdulmutallah, to slip past Schiphol’s normally stringent security with explosives sown in his underwear on Christmas Day 2009 and board a Northwest Airlines plane. Quite a record… and yet we don’t know, it may all be coincidence. Even so: why did the DSB not delve into these matters and instead chose to lie about the battery cargo? Why did Malaysia Airlines remove the cargo manifest in which the batteries are listed, from its website? There are many more such questions that can be raised. Again, my aim in the book was to list all the elements that we can be certain about, so that meaningful speculation beyond them becomes possible and pertinent hypotheses may be formulated. Then it may take only one more piece of evidence, one witness statement, one new, unbiased investigation, and we will have come much closer to establishing the real reasons why MH17 was shot down.